**Red, green and yellow bell peppers may be added for more color, if desired. Just finely dice them if you add to the recipe. Cut the fish into bite size pieces and place in a large glass bowl with the lime, lemon and orange juices. Add the garlic, red onion and pepper, tossing all to coat. Cover with clear wrap, and refrigerate for 4 hours, stirring occasionally. (You may refrigerate overnight, although you might find the fish tastes more like citrus juice than fish. Your choice!) Remove from the refrigerator, uncover and add salt, pepper and cilantro, stirring gently to mix. You may serve this on a tostada, with chips, or in a beautiful martini glass with a lime wedge and avocado slices for garnish. 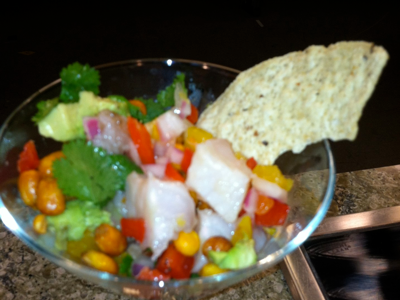 Serve with cancha - Peruvian corn nuts. Enjoy!